If the monsters go down first the combat is won. If a PC’s hit dice go down before that, they’ve been reduced to 0 hp. In Carcosa the dice shape is randomly determined (so you could be rolling d4 or d12). I prefer Necropraxis’ stabilised hit dice where the dice are d6 all the time. 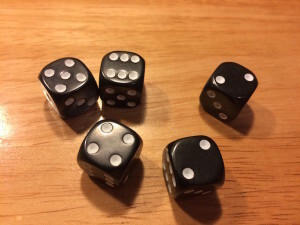 So, for a more general application, any time there’s a threat or obstacle, throw down a pool of dice representing that obstacle that the players have to knock down. The players also have their own pool of dice and if those get knocked out, they take the consequences. It may make sense to have only the GM having a clock, or the players only having a clock. This would work a lot like the clocks in Blades in the Dark, with about as many permutations. When the PCs are infiltrating a castle, they have a collective pool for their stealth. Blow a stealth roll and the clock goes down; when they have no dice left, the castle is on alert. When the party are trying to investigate a set of murders and stop the murderer before they strike again, they are trying to knock down the GM’s pool which represents how well the murderer is hidden. The GM rules that they roll once per night, and if they haven’t cleared the pool in three nights there will be another killing. A PC is under cover at a party, trying to seduce a NPC. Both the GM and the player have a pool of dice, and if the GM’s pool goes down first then the PC succeeds; if the PC’s pool is knocked out, they get booted out of the party. The stealth and combat examples are fairly narrowly defined. 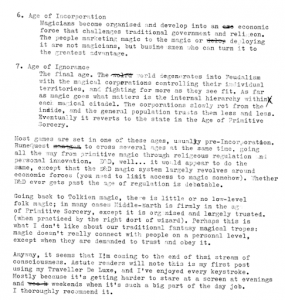 The others are a bit broader, abstract and freeform — e.g. 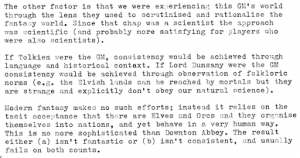 the murder enquiry would traditionally be a constructed investigation with a trail of clues (Cthulhu, etc.) but in this case the players are rolling to get a clue, and the GM is making up the clues as a response to the dice results. 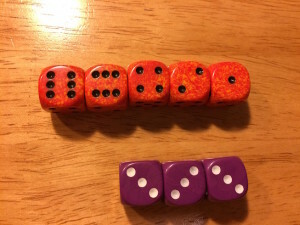 Using the dice like this mean that more than one kind of roll can be used to knock down the clock, if you want to play like that. Both stealth (dexterity) and misdirection (social) rolls could be used to avoid detection in an infiltration or heist. Just be clear on what skill rolls will affect what clocks. How do dice get knocked down? By rolling a success. 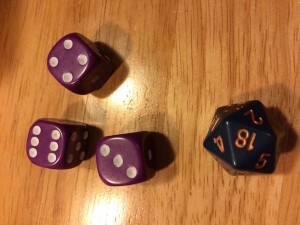 In a d20 system, if the PCs are “attacking” the GM’s dice pool, they knock out a number on the dice equal to the margin of their success (so a 17 vs a target of 12 knocks out 5 points on the GM’s dice). By failing. If the PCs are rolling to keep their cover and they fail, their dice pool goes down by the margin of failure (e.g. rolling 8 vs. a target of 12 means they go down by 4). This system works with both roll-over and roll-under. 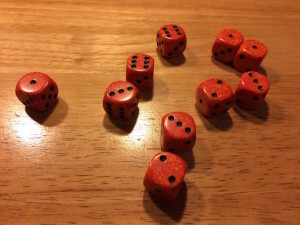 If it’s roll-under the margins of success have the potential to be big and the margins of failure are limited by the maximum on the dice (20). Just as in AW and BitD the clocks can be knocked down by more than one kind of action, encouraging teamwork. If the team were working together in a heist, they might overcome the bank’s defences with a combination of subterfuge, stealth, technical know-how and even brute force. All qualifying actions count for knocking down the dice clock. Using the clocks like this injects a bit of narrative woo into the typical d20 style games, if you like that sort of thing. When the clocks are rolled, the GM should (normally) be clear and up-front about what the GM’s dice mean, what the players’ dice pools — or collective dice pool — mean, and what actions will result in pools being under attack (e.g. for combat the only thing that can knock each side’s dice down are direct attacks). This system could eliminate separate damage rolls. Instead, use the margin between the target and the actual number rolled as the damage inflicted (so a roll of 15 vs AC 12 is 3 points of damage). Between combats or stressful situations, hit dice come back. The rate of return depends on the GM, and healing rules. If all the dice come back it will be more cinematic. It makes sense if no dice come back (because it’s luck) or if all the dice come back (because it’s experience). HD are a combination of experience, capacity for fatigue, will to survive, and luck. They can go down without causing a problem until you hit zero. If HD are a more general resource, how are wounds dealt? How do characters die? If you have a class-based system, how do you make sure the fighter can take more punishment in a fight than the magic-user — especially if you’re rolling the same shape dice for everyone? Deal Harm. I like the idea of applying damage directly to stats (i.e. the Classic Traveller way). Optionally, require some kind of saving throw to avoid permanent injury or death. This would mean healing spells work a bit differently. Announce “future badness” or make a mental note of some complication for later use. Take something away (a skill, an item, magic, contacts) either temporarily or permanently. How many dice for each character class? If this were combat only, you could start fighters with three dice, rogues with two and mages with only one. Fighters get 2 extra dice in combat, every time. So even if they’re down on their hit dice, they will start any new combat with two new dice right there. Other classes don’t get that. Similarly Mages get 2 extra dice in psychic or magical combat, every time. Rogues could get 2 extra dice for social situations. Or they could get a floating pool of one-use dice that other classes don’t have. In no particular order, here are some other permutations of dice clocks. If teamwork is needed, the party can pool their dice together into one big pool, representing a common action (e.g. stealth). If this happens, make sure everyone who’s in the group rolls dice. Those characters who are bad at stealth actions should be a liability and knock everyone’s clock down. If you have more than one threat clock, use two different colours of dice, obviously. This would work if the party were, say, fighting a whole bunch of goblins and one powerful sorcerer. For combat the GM can roll one big pool of dice to represent a horde of monsters. Just decide how many attacks or actions that horde can take at one time. When the dice are rolled, highest numbers are knocked down first. So if you roll a 6, 4 and 3, the 6 needs to go down before you tackle the other two. You could use this rule to create interference. In the above example if the goblins’ dice are higher than the sorcerer’s, that means they’re getting in the way and the party must deal with them first before they can knock the sorcerer down. This could also be used for the party. Let’s say all the players put down a separate group of dice for each characters; even if the Fighter should be in the front line, if the Magic User has a higher Hit Die, then they might cop an attack first. Offset this by letting the fighter actively sacrifice their dice to protect the MU. Sacrifice one of your own dice to protect someone (say, prevent a consequence landing on another character) or to do something cool (maybe even a narrative control mechanic). Bid your dice like poker chips. If you have stages of effect (say, stages of alert in an infiltration) where at certain points something happens (the guard is doubled, the score is moved to the vault, etc. ), represent with two different colours of dice in two pools. When all your orange dice get knocked down, that’s a stage 1 event. When the purple dice are gone too, that’s a stage 2 event. This process probably doesn’t with the interference option, however — the pools are knocked down sequentially. By default, roll the dice on the table and let the players see them and decide how to handle them. Be clear about what those dice represent, e.g. how close the guards are to sounding the alarm, luck running out in a chamber full of traps with pressure pads, etc. If you keep dice back it should be because there’s something the PCs haven’t seen yet that you want to keep track of. Roll that dice clock behind a GM’s screen or something. I’m not sure yet if this system has legs, or if it’s another fantasy heartbreaker. 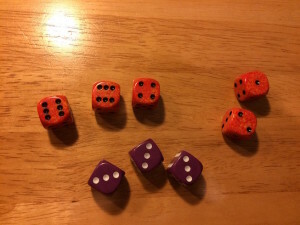 Certainly running OSR combat Carcosa style but with the stabilised hit dice has a couple of benefits: one, the dice on the table are a stake and something nice and tactile, and two, book-keeping is easier with low integers. Provided for context in case the reader isn’t familiar with the various sources. and at the end of combat lasting harm is counted in the number of dice you’re down. it keeps lasting wounds between combat in low numbers, which is tidier. Otherwise it doesn’t change much function-wise. If you don’t care for the dice randomness this post (Necropraxis) suggests flattening this out to d6s for everyone. And so on. Interesting that John Harper doesn’t use a personal clock to measure character damage, as is Apocalypse World’s way. Note also that Harper uses the clock as a variable count where zero represents the change of state, rather than having something happen at each segment per the advice in Baker’s book. I love the concept of clocks, although I’ve never been satisfied with their explanation in AW, and while BitD’s kickstart gives a lot of options it doesn’t give enough examples of play. It’s not clear in either game whether the clocks are meant to be in view of the players — that would make sense, right? Otherwise, what’s the point of ramping up that tension if the players don’t feel it, and take steps to address it? But AW is clear that clocks are a prompt for the MC, not the players. 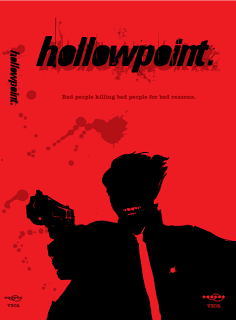 Hollowpoint is all about the dice — the core of the game is a dice conflict where matched sets of d6 are used to attack each other’s dice pools. One of the mechanics is the Catch, which is a pool of dice that represent a mission objective (steal a thing, get some information, assassinate someone) which can only be knocked out by one skill. I’ve been thinking about this “wave” business a bit more. Not with the view to putting things in boxes, but more what it means as a pop-sociological analysis. Waves of things are characterised by peaks and troughs; they’re frequently discontinuous (q.v. first, second and third-wave feminism). Waves mean a resurgence of interest, after a period of low activity. The OSR itself is a second wave. A wave can be a response to the deficiencies of the previous wave (or the trough that came after it). It looks like the “second wave retroclone” monicker was coined as early as 2011. 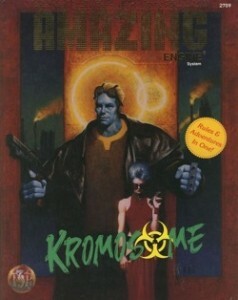 ‘Second-wave’ retroclones is a name I made up for those systems that a) are built on the work of the original wave, which used the OGL and reverse-engineered the d20 SRD to make it possible to publish stuff that emulated older editions and b) are now focused on supporting a specific style of play rather than a particular edition. I will repeat this term until it sticks. Anyway, if you want to stick to this kind of “wave” analysis, the period we’re looking at is around 3 years for the OSR. 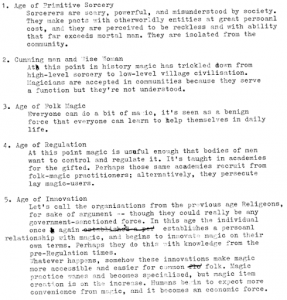 Compare that with the 5 year cycle of design evolution proposed by Vincent Baker (Narrative Control ep. 82). Compare that with how long games are generally in development. What is the rate-determining step for these changes? Games aren’t designed in a vacuum, so it may be the social component — how quickly ideas propagate through forums, get support and willing playtesters. That’s a separate issue from the logistics of getting the thing made. Who benefits from calling these first, second and third wave products? Allison is an advocate of the transition from first to second wave products, with the benefits of better product definition, commercial focus and higher professional standards. But if the design cycle’s rate determining step is social propagation then talking in these terms is also likely to reduce those barriers, lubricating the wheels of design and shortening the interval. By that analysis, a 3 year cycle may be a credible proposition. Guy Windsor has been thinking about violence lately. I’ve also been thinking about violence. I started when Jeremy Clarkson punched Oisin Tymon; before Ken MacQuarrie’s findings on the incident around the 25th of March, even before the change.org petition to reinstate Clarkson passed the million mark on the 20th. I have no opinion on the BBC’s handling of the case. I don’t care if the BBC used this altercation as an excuse to rid themselves of Clarkson; it’s far more likely that they tried everything they could to avoid sacking him, given his export value. What was in the minds of Clarkson, Tymon, the Times editors, and the 1000000 people asking for Clarkson to be reinstated? I suggest that your emotional response to the injury is at least as important as the injury itself. Deciding whether Buzz Aldrin’s punch was right or wrong requires that you take the context of it into account (I was careful to link to the version of the video that shows the build-up); and determining the damage done necessarily entails finding out how the prick (I will not call him a victim, because he was the victimiser, neither will I mention his name) responded emotionally to the violence. Did it give him nightmares? Probably not. He probably went back to his posse wearing his aching jaw as a badge of pride. Those involved in the Clarkson case will also have gone through this process of wondering whether the violence against Tymon was justified. In that process some people downplayed the severity of the attack — James May called it a “dust-up” and “not that serious” but that was probably because he’d been doorstepped and sensibly avoided saying something inflammatory. But what about the 1000000 who petitioned for Clarkson, or The Times, or Katie Hopkins? Do they really view physical and verbal assault as the cost of doing business? And of course we don’t have Tymon’s view on it. He just wants to put it behind him; no doubt it’s been remarkably stressful on him and his family, no doubt it was a horrible incident both physically and psychologically, no doubt he’s wondered if the violence he suffered was somehow justified because of a personal failing. Of course we don’t think about these questions — because he’s a man and men should “take it”, because it’s “not that serious”, because he’s in the realm of Celebrity and Celebs… just do that kind of thing. And that’s also the Clarkson Effect. People justified on his behalf, even without the full facts, because of his following, and they blamed Tymon and the liberal BBC, not him. Back to Col. Aldrin, I don’t like to think about whether the punch was justified. That’s a matter for the law. But as Windsor puts it “the person who got punched was using our culture’s restrictions on violence to get away with a different kind of violence”, and I’d probably want to punch him too. Nevertheless I’m glad Col. Aldrin did and not me. Recently Ione Wells spoke out about her sexual assault in an open letter that made national news. Ms Wells’ letter talks about the way violence is an attack not only on persons but their communities. I don’t know who the people in your life are. I don’t know anything about you. But I do know this: you did not just attack me that night. I am a daughter, I am a friend, I am a girlfriend, I am a pupil, I am a cousin, I am a niece, I am a neighbour, I am the employee who served everyone down the road coffee in the café under the railway. All the people who form those relations to me make up my community, and you assaulted every single one of them. You violated the truth that I will never cease to fight for, and which all of those people represent – that there are infinitely more good people in the world than bad. I wouldn’t dare compare her ordeal with a celebrity punch-up. But the responses to #NotGuilty say a lot about the culture of entitlement and tolerance for psychological violence towards — which is I think exactly the same root as dismissing the violence towards Tymon and telling him to “man up”, because 1000000 people feel entitled to Top Gear. I was going to say something about martial training — which is necessarily violent, but the intent is not to terrorise or cause injury. At least, not in any decent school. But this post is already a bit long so I’ll save that for another day. 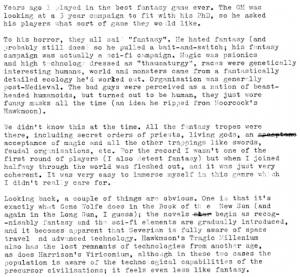 The Tears of Envy blog has a project on called Cyberpunk 1984 (not Orwell, but the year Neuromancer was published) capturing Cyberpunk as an artistic movement. Cyberpunk has been and gone. The successor to cyberpunk is–what? 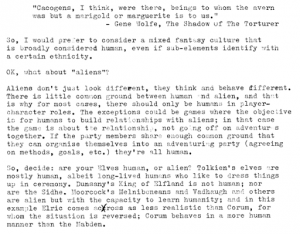 Transhumanism, I suppose, given the promise of GURPS Transhuman Space and Eclipse Phase. 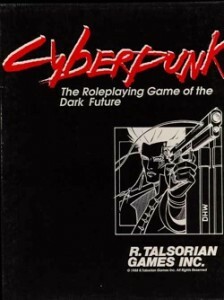 The first edition of the Cyberpunk rpg is set in 2013. The future is here, with chrome, shoulderpads and big hair. Interface Zero is purported to be an updated Cyberpunk for our wireless, overlayed augmented reality HUD world. From what I know of IZ it appears to embrace transhumanism as well as updating technology to include wireless communication, etc. 1. Always plugged in. There is no wireless in the Gibson Continuum. 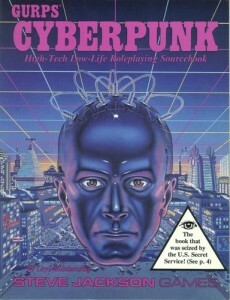 Manual emergency disconnects from a cyberdeck before black ICE hits may result in physical damage to the cranial sockets. It’s going to be a PITA for Solos with smartlinks to their weapons, too–they’re likely to snag that flying lead on every doorknob and coat hook. Unless it’s 2013 and there are no more coat racks, punk. 2. Tiny screens and massive storage. That’s right, the highest tech computer uses a 14in green-on-black CRT. At the same time, information storage is on good old reliable standard: VHS. Or maybe Laserdisc, if you’re lucky. 3. 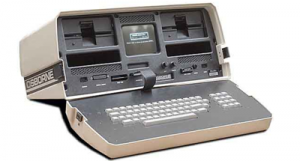 Stuff is heavy; that Cyberdeck weighs at least 8lbs, and your VHS video camera is huge. Cybernetic eyes may require hardware exernal to the eye socket. Overall the Gibson Continuum’s encumbrance rules eclipse the cyberware humanity rules. 6. Exotic locations with portmanteau identifiers, e.g. San Angeles. 8. Literal mapping in Cyberspace where nodes correspond to virtual 3D space–so if you want to shop online, you need to enter the virtual store and go to the correct shelf for your goods. 9. Relative ease of living “off the grid”; satellite imaging is behind our current tech, personal GPS doesn’t exist. 12. Rockerboys, Fixers, and Solos, oh my. That’s all for now. The list will grow and be refined–especially after mining the visual media list for inspiration. A brief list of media for visual style cues. Most of these come from the GURPS:CP list, though a couple (Until the End of the World, Wild Palms) post-date the book. 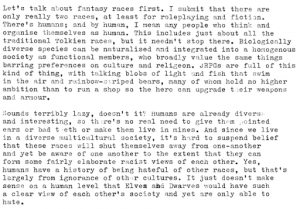 Eutopia (sic) is Scary (uses the same quotation I used above from GURPS Cyberpunk) and the (maybe a bit more relevant) follow up essay, Why is the future so absurd?